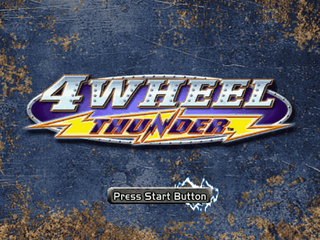 4 Wheel Thunder is an off-road racing game developed exclusively for the Sega Dreamcast by Kalisto Entertainment. It was published by Midway Games as part of the Thunder racing franchise - the second game in the series to be released on the Dreamcast after Hydro Thunder. The game was not released in Japan. The game had a protracted development timeline, originally being announced as Xleration in the summer of 1999, before changing its name to Offroad Thunder in October and eventually settling on 4 Wheel Thunder. Main article: 4 Wheel Thunder/Magazine articles.